I want to setup alerting to monitor interface discard and error rate. I went into the Advanced Alert in trying to setup the alert for these two parameters but not sure what threshold value to be used for discard and error on an interface as shown below. I went into the Advanced Alert in trying to setup the alert for these two parameters but not sure what threshold value to be used for discard and error on an interface as shown below. Did you have an attachment you wanted to show? I don't think it came through. 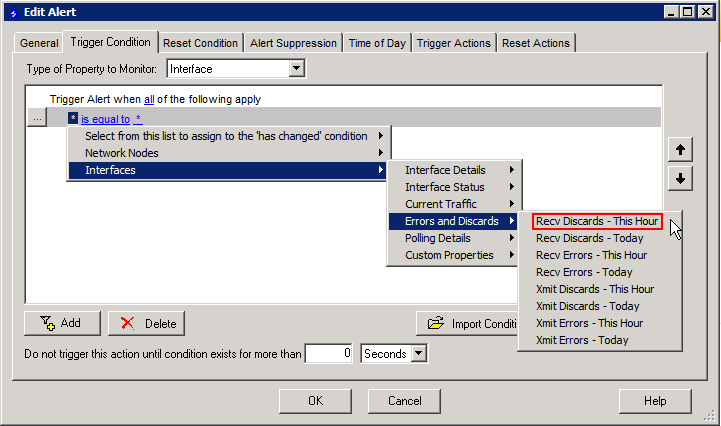 I also am trying to set up alerts for error/discards. Our MPLS Circuit is not of the best quality. Instead of going down it just gets tons of errors/discards. From what I can tell, in the alerting module, you can only get as detailed as per hour. Unfortunately it really doesn't help me to get an alert an hour after this starts to happen. Is there ANY way to get more granular than once per hour?